With his peace overtures to Pakistan and refusal to send troops to Iraq, Vajpayee showed compassion that few leaders are capable of. New Delhi: There hasn’t been a more peripatetic prime minister than Narendra Modi in recent times — he has so far made 86 visits abroad. In contrast, the first BJP prime minister, Atal Bihari Vajpayee, in his first full term (1999-2004), made just over half the number of trips (46) out of the country. 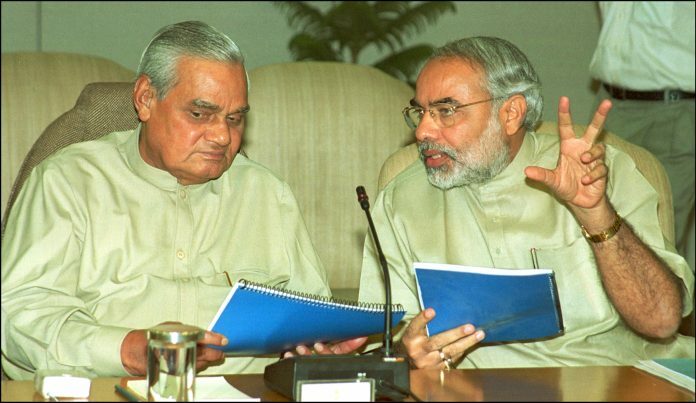 In terms of time taken, Vajpayee’s were far longer and possibly more relaxed but in terms of the number of words spoken, his count was definitely lower than that of Modi. And yet, when the long arc of history has its way, Vajpayee, who has since gone gently into the good night, will be remembered as a far more astute politician, whose slow and measured speech, while being fatherly and friendly, could carry such a sting in its tail that it stopped the Opposition dead in its tracks. There is no better story about him than the time he called off the Agra summit in July 2001. In the weeks preceding the Agra summit, much to the chagrin and annoyance of bureaucrats from the Ministry of External Affairs, Vajpayee phoned Pervez Musharraf, the Pakistani Army chief who had recently named himself President. The fires from Kargil, muttered MEAwallahs, had hardly been put out and the “enemy” was being invited. In Agra, Musharraf was given the best suite in the hotel — every room, including the toilet, had a view of the Taj. The Pakistani leader made most of his tour, changing his clothes five times a day and loving the celebrity status that came with the non-stop attention. That was until the breakfast meeting with editors, caught on camera, in which Musharraf exhibited, what foreign minister Jaswant Singh later described as “grandstanding fever”. The Pakistani leader not only refused to accept the problem of terrorism, he was dismissive of the Lahore summit, would not take responsibility for the 1999 invasion of India at Kargil and even more or less dismissed the Shimla agreement. Only the Kashmir dispute, insisted Musharraf, was the central issue between India and Pakistan. When Vajpayee saw the breakfast tape recording, broadcast on NDTV non-stop, his mind was made up. There would be no Agra Declaration. Musharraf called on him, to plead for an agreement, but to no avail. Without uttering a word, Vajpayee called off the Agra talks. He would simply not be bullied. Two years later, at the last minute, Vajpayee would reverse a commitment his own deputy prime minister, L.K. Advani, had given to the Americans to send a battalion of troops to Iraq, which George W. Bush had recently invaded on the pretext that Saddam Hussein possessed weapons of mass destruction. To the ears of a foreign policy elite weaned on anti-Americanism, memories of the USS Enterprise sailing into the Bay of Bengal in 1971 and Nixon warning Indira Gandhi from making too many smart moves against Pakistan — soon after the creation of Bangladesh, Vajpayee famously described Indira as ‘Durga’ — this was anathema. But in the wake of the 11 September 2001 attacks, India offered all kinds of privileges to the US, including over-flight rights and bases in Indian ports. Vajpayee agreed with Jaswant Singh and his principal secretary Brajesh Mishra that US presence in Afghanistan and Pakistan was a good thing, as it would keep a check on Rawalpindi’s destabilising efforts in the region. ‘Yankee Go Home Slowly’, is how in 2003 Jim Hoagland of the International Herald Tribune described the thrust of his conversation with Vajpayee. The Clinton visit had come in the wake of rapidly warming relations between India and the US. During the Kargil conflict, Clinton summoned Pakistani prime minister Nawaz Sharif to Washington D.C. and told him to do what Vajpayee had essentially laid down as the bottom-line: Walk back across the Line of Control. Only then would India end the war. Just a couple of months earlier, the Vajpayee-led NDA had lost the vote of confidence in the Lok Sabha by the slimmest of margins — one vote. Meanwhile, Pakistani soldiers of the North Light Infantry, disguised in civilian clothes, had walked into India at Kargil. The invasion was discovered in May when Jaswant Singh was on a visit to Ashgabat, Turkmenistan. As the world fretted about two nuclear powers going to war, Vajpayee as interim prime minister, not only marshalled the troops at home, he also succeeded in telling the world that India’s retaliation was “just”, and that it would never refuse the hand of peace but would always turn down a threat at gunpoint. So when the Americans in 2003 demanded a battalion of Indian troops and both Advani and Mishra said yes to Uncle Sam, it was Vajpayee who found the courage to say No. Vajpayee’s heart belonged to the subcontinent. America was a great country but at the end of the day, he left the nuts and bolts of improving the relationship to Jaswant Singh and Brajesh Mishra. Despite all the wars with Pakistan, despite all the violence in Kashmir, despite cross-border terrorism from Pakistan, Vajpayee recognised that the road to regional peace lay through a three-legged conversation between Delhi, Srinagar and Islamabad. In 1978, as foreign minister in the Janata Party government, Vajpayee had floored the Pakistanis with his “flawless Urdu” conversations, said Ajay Bisaria, high commissioner to Pakistan, in a Facebook post. That visit led to the resumption of cricketing ties and the opening up of consulates in Karachi and Mumbai (both were shut down a decade or so later and have never been reopened since). In 1999, Vajpayee would make a dramatic pitch for peace, by taking the bus from Amritsar to the Attari-Wagah border. The poet-politician understood the craving of Hindu refugees like Dev Anand, who travelled with him on that bus, returning “home” to Lahore, if only for a day or so. Vajpayee would make history by visiting the Minar-i-Pakistan on that visit, a huge tower that stands in the shadow of the Badshahi Masjid and Maharaja Ranjit Singh’s Samadhi in the old city of Lahore. It was built in 1968 on the site where the Muslim League, in 1949, had passed the Pakistan Resolution. By visiting the Minar, the self-proclaimed RSS swayamsevak Atal Bihari Vajpayee was signalling that the RSS and the BJP’s willingness to abandon its underpinning of Akhand Bharat, and coming to terms with an independent Pakistan. Despite Kargil, despite the failure of the Agra talks, despite the hijacking of IC-814 from Kathmandu to Kandahar in December 1999 — and despite a troublesome resolution of that hijacking, which ended in India handing over three Pakistani terrorists, who promptly disappeared into Pakistan; one of them, Masood Azhar, soon launched the terror group, Jaish-i-Mohammed — Vajpayee never gave up on his peace mission to Pakistan. On 15 April 2003, he travelled to Srinagar and gave the call for dialogue. “Kashmiriyat, insaniyat, jamhooriyat,” he said, talks will be held under the ambit of humanity, not within the ambit of the Constitution, turning every democratic principle on its head. India held its breath. The Kashmiri militant groups, as well as the Hurriyat, responded. Building on that peace proposal, Vajpayee undertook his final journey to Pakistan for the SAARC summit in January 2004. The Pakistanis were so excited that Shaukat Aziz, then prime minister, even had Vajpayee’s measurements taken so that the star designer Amir Adnan could stitch him a sherwani. “For him, no risk was too great if it was for peace,” says Bisaria. The SAARC summit would go down in subcontinental history as an event in which India won and Pakistan didn’t lose either. Both sides agreed that Pakistan would commit to ending terror in exchange for dialogue. As prime minister, Modi ponders over whether or not he should attend the SAARC summit in Pakistan later this year; he should call for the files and study how Vajpayee dealt with a recalcitrant neighbour. In his Independence Day speech Wednesday, Modi repeated Vajpayee’s inimitable ‘Kashmiriyat, insaniyat, jamhooriyat’ phrase. Except that the reality on the ground is exactly the opposite. The BJP is determined to crack down on the “nuisance-mongers” in Kashmir, knowing fully well that this may lead to further violence. As he passes gently into the good night, Vajpayee’s legacy is so enormous that it simply cannot be contained by the BJP, leave alone the RSS. He understood the importance of the “raj dharma”, at home and abroad. He demonstrated compassion towards the enemy that few men are capable of. Possibly, that’s because he understood that the enemy, just like friends, must also be treated honourably. Atal Bihari Vajpayee embodied the idea of India, in that the country’s legacy as a diverse and unique civilisation is meant to be shared by everyone. Vasudhaiv kutumbukam — the world is one family. Modi uses the phrase a lot, his BJP predecessor Vajpayee showed us what it truly meant. Vajpayeeji, too, loved foreign travel. As EAM during the Janata period, he was called Shuttle Bihari Vajpayee. As PM, he took time off to visit the Angkor Wat temple complex in Cambodia, topping it off with an ice cream cone. Doubt if he would have had much use for someone like Ms Rujuta Diwekar.